Camu is also shown as being anti-mutagenic, which means it helps prevent the genetic mutation involved in the creation of cancer tumors. In fact, if you can prevent DNA mutations in your body, you will live longer, have fewer chronic diseases, and greatly reduce your chances of ever being diagnosed with cancer. One of the most impressive characteristics of camu is its anti-Parkinson's quality, so if you have Parkinson's disease or if you would like to protect yourself from Parkinson's disease, the camu berry is one of the things you should put on your investigation list. Again, it doesn't mean that this is a cure for Parkinson's disease; but it can certainly be a healthful nutritional tool that can either reduce the progression or potentially protect you from ever having it. Camu is also antiseptic, which means it kills bacteria. You can even use camu on your skin. If your skin suffers an injury, you can actually squeeze camu berry juice -- or sprinkle camu powder -- right on the wound to help prevent infections. I have not used it this way, but if I were injured I wouldn't hesitate to do it. Personally, I find that plants are the best first aid. 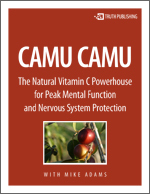 Camu is shown as being anti-ulcerous, anti-herpes, and hypotensive. If you're suffering from hypertension or high blood pressure, taking the camu berry can help naturally lower your blood pressure. The most likely mechanism for this is that vitamin C combined with the mineral content of the camu berry helps relax the blood vessels throughout your body. This allows your blood vessels to be more flexible and to simultaneously reduce your overall blood pressure. Some people who drink powdered camu fruit say that it brightens their day and clears their mind. That's not surprising, because many phytochemicals from camu camu go right to your brain, protecting it against oxidative damage and toxic chemicals that may be circulating in your blood. The result is that you feel better almost instantly. Taken over the long term, it helps prevent chronic degenerative disease; your mood is lifted; your vision improves; you get mental clarity perhaps unlike any you've experienced for a long time. If you've ever cared for an elderly person, then you know how frustrating and sad it is to see someone who can't dress or feed themselves, can't communicate, or can't control their muscle movements because they suffer from the degeneration of their nervous system. I used to volunteer in a nursing home and I've had people in my family who've suffered from these conditions in the past, and the truth is that we now have at our disposal the nutritional tools to help prevent this kind of suffering; we can help people lead higher-quality lives as they age. We can give them back the mental clarity they once had with these nutritional tools.